PediaSure SideKicks provides balanced nutrition, with 40% more protein* and 25% fewer calories* than PediaSure® Grow & Gain. It’s available as a convenient, ready-to-drink shake. * Than PediaSure Grow & Gain. PediaSure SideKicks® – 10g protein and 180 calories per 8 fl oz; PediaSure® Grow & Gain – 7g protein and 240 calories per 8 fl oz. † Natural and artificial flavors. ¶ Than PediaSure Grow & Gain. 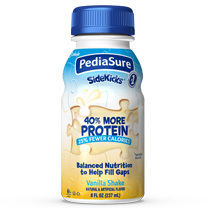 PediaSure SideKicks® – 10g protein and 180 calories per 8 fl oz; PediaSure® Grow & Gain – 7g protein and 240 calories per 8 fl oz.